Whilst we agree, there’s nothing quite like a pancake covered in maple syrup, chocolate spread and banana to satisfy the sweet tooth! We believe savoury pancakes are often overlooked. We’ve been busy in the kitchen coming up with our Seafood versions and we’re sure you’ll agree they don’t have to be restricted to Shrove Tuesday! This is a basic pancake mix – blend the flour, eggs, milk, oil/melted butter and salt together to make a smooth batter – it should have the consistency of single cream. Different brands of flour behave differently so adjust by adding a little more milk to thin or flour to thicken. Change the flavour and texture of the pancake by replacing the plain flour with Buckwheat Flour (this gives a gluten free pancake) – you may need a little more milk for this one. Try replacing half the flour with corn meal for a different textured pancake. Ok then now for the interesting part! 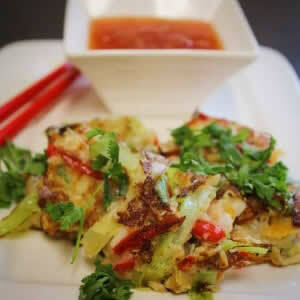 This uses a standard pancake batter but the pancake is topped with Regal Seafood Cocktail that has been defrosted and roughly chopped, 4 spring onions sliced along the length and chopped chilli – half to a full one depending on how hot you like it! It is served cut into bite size pieces with a dipping sauce made from soya sauce, rice vinegar, garlic, ginger with a bit of water to dilute. I would think sweet chilli sauce would go with it as well. 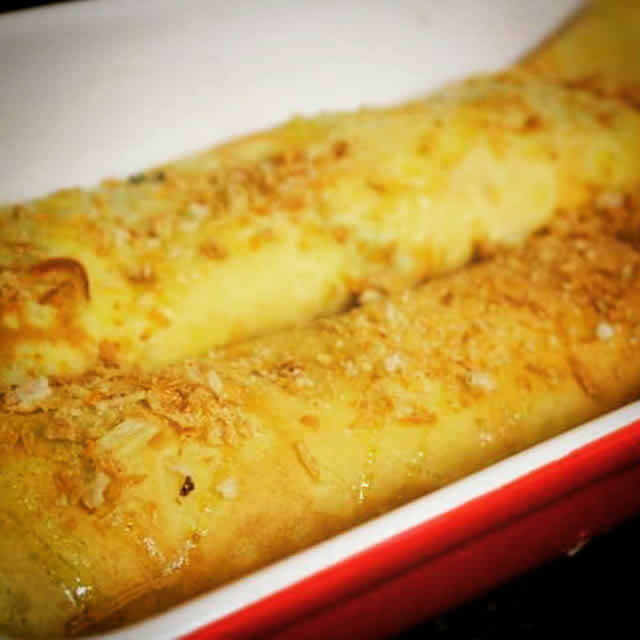 Method – Heat a splash of oil in a frying pan and pour in a layer of pancake batter. Scatter over half the chopped seafood, 2 sliced spring onions and a sprinkle of chopped chilli then drizzle over a little more pancake batter – save enough to make the second pancake. Cook the pancake until the base is golden brown then carefully turn over and cook until golden and cooked through. Repeat to make the second pancake. Serve cut into squares and serve with the dipping sauce. In a saucepan – melt the butter and mix in the flour. Cook this mixture gently for 2 minutes and take off the heat before adding the milk gradually, whisking well. Bring to a gentle simmer for 5-10 minutes until the sauce has thickened. Reduce the amount of milk for a thicker sauce. Season to taste. In the microwave – place all the ingredients (except seasoning) in a large bowl and whisk together. Cook on high for 2 mins then remove bowl and whisk well. Continue to cook on high for a further 2 mins and then whisk well. Cook for a further 2 minutes then season to taste. Use this sauce as a base for your pancake filling as suggested below. 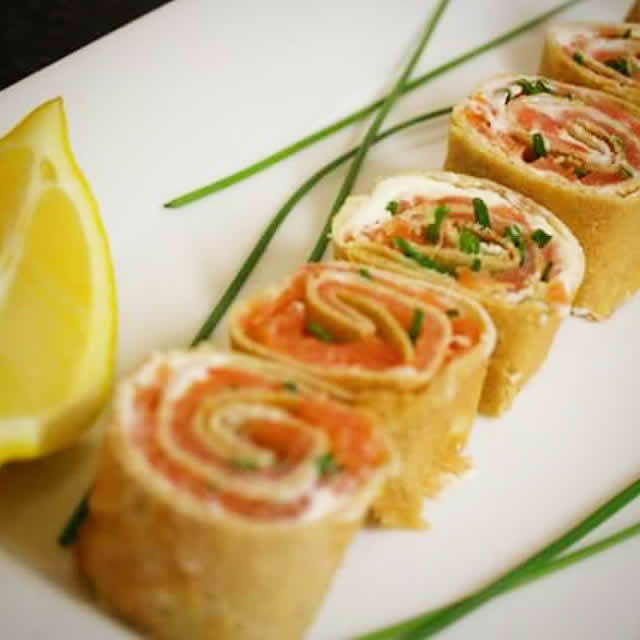 Try replacing half the milk with white wine for a white wine sauce or adding grated lemon zest and a squeeze of lemon juice along with chopped fresh herbs. 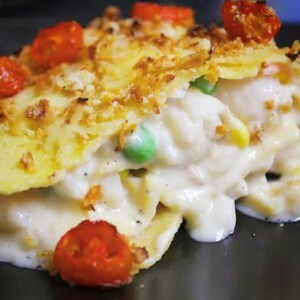 Next we layered up a white fish lasagne with pancakes instead of pasta sheets! with the basic white sauce and a handful of frozen peas and sweetcorn. We made 2 simple pancakes and topped half the fish mixture with a pancake before another layer of fish and topping with the second pancake. Once we had finished layering we topped with grated cheese, breadcrumb and some chopped baby tomatoes. This was transferred to the oven for around 15 minutes at 180oC. This isn’t any old Smoked Fish!! This is Traditionally Smoked Haddock from what is believed to be the oldest smoke house on Grimsby Docks, MTL fish curers. We took 500g and cooked it for roughly 4-5 minutes in the microwave. 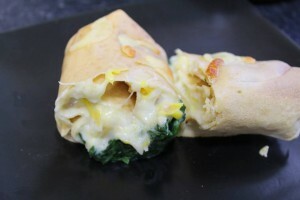 We discarded the skin and chopped it up before adding a generous tablespoon of whte sauce, a handful of spinach and a sprinkle of grated cheese and then rolled it into 2 precooked pancakes. So easy and ridiculously delicious! We made 2 pancakes and very simply laid 200g of delicious Scottish Smoked Salmon and a combination of cream cheese/ crème fraiche with a tiny squeeze of lemon juice. We then rolled them up and sliced into bite sized pieces. Before sprinkling chopped Dill over the plate.